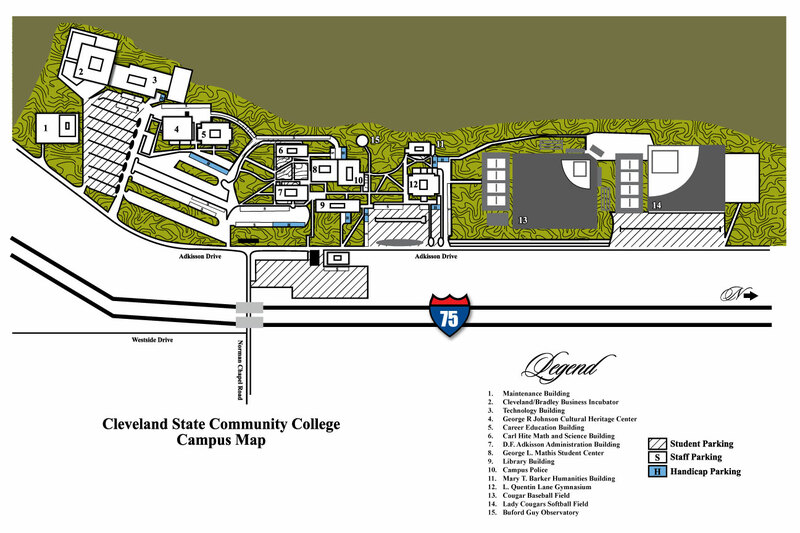 Cleveland State Community College strives to provide an accessible campus where all students feel welcome in an environment structured to support the individualized needs of our students. The staff of the Counseling & Career Services Office, and in particular Disability Support Services (DSS), is dedicated to opening doors of equal opportunity for students with disabilities so that they can fully participate in the academic experience and contribute to the diversity of our campus. We believe that education and self-advocacy are the keys to success. Self-advocacy begins immediately after students are accepted to the College. It is important for students to remember that it is their responsibility to request accommodations in the post-secondary setting, and that process starts here at DSS. We assist students with documented disabilities by determining their eligibility for services and then working with them individually to structure reasonable accommodations and services which will provide the student equal access to the College. It is the mission of Disability Support Services to partner with the campus community in creating equitable access through reasonable accommodations for eligible students while promoting disability-inclusive diversity. Two laws govern the rights of students with disabilities in the post-secondary environment. The Americans with Disabilities Act (ADA, as amended in 2008) defines a disability as a physical or mental impairment that substantially limits one or more life activities; a record of such impairment or being regarded as having such an impairment and protects such individuals from discrimination. Section 504 of the Rehabilitation Act of 1973 guarantees access for students with disabilities. Through these protections, Disability Support Services is here to provide you with the tools necessary to achieve success. If you are affected by a disability and feel that you could benefit from accommodations, please print our Disability Support Services Application & Accommodation Planning Form and start on your road to success. Take the ACT/SAT with appropriate accommodations. Contact your guidance counselor to secure your accommodations. Be prepared… study in advance. Many students cannot identify their specific diagnosis. Become informed and practice being a “self-advocate” by being able to explain your disability and the kinds of accommodations you need. Make sure that your diagnostic documentation is up-to-date and meets college guidelines. Remember, an IEP is not acceptable and documentation should have been completed within the last 3 years. Contact your local Vocational Rehabilitation Office for an appointment to discuss the possibility of assistance. Fill out an application for admission and submit the fee. Submit high school/college transcripts and ACT scores to the Enrollment Services Center. After you are admitted, disclose your disability and provide appropriate disability documentation to Disability Support Services in the ACCESS Center (disclosure is voluntary, but encouraged). Check with Admissions in Enrollment Services to see if you need to take the placement test before enrolling. Contact Disability Support Services BEFORE taking the placement test to request accommodations (requests are voluntary, but encouraged). Take the placement test, if necessary. Schedule an advising appointment to register for classes. Download the Disability Support Services Application, Accommodations Planning Form, appropriate documentation requirements, and complete and call (423) 473-2427 for an appointment to meet with the coordinator to disclose your disability and discuss documentation. Complete online orientation and attend campus orientation. Pay tuition, buy books and come ready to go! Diagnostic testing services are not provided at CSCC, but we do maintain a list of resources that can aid you in completing the appropriate testing. We encourage you to complete yourapplication, and download the documentation requirements for your specific disability that follows. Advance preparation will expedite the process of qualifying for accommodations. Once you have completed your paperwork, please call to set up an appointment with the Coordinator of Disability Support Services at (423) 473-2427 to discuss your needs and the accommodations for which you qualify. Accommodations are determined based on review of submitted documentation from the health care provider for its appropriateness and completeness under Section 504 of the Rehabilitation Act of 1973, the Americans with Disabilities Act of 1990 (ADA) and as amended in 2008 (ADAAA), and the Office of Disability Support Services documentation policy. Specific accommodations are determined by a discussion between the student and the Disability Support Services Coordinator. The discussion will encompass past accommodations that were effective and possibilities that are available in the post-secondary environment. Since colleges and universities guarantee access not success, not all accommodations utilized in secondary education are available. A plan will be prepared that will make the most effective use of the appropriate accommodations for the student’s disability. The following is a list of available accommodations. This list is not comprehensive since services are provided to meet the needs of the individual. Tutoring is available for students 24 hours a day through Tutor.com online tutoring through the student CougarNet account. There is also tutoring available for all disciplines in the Language Arts Learning Center. Cleveland State provides computers with assistive technology in both the Testing Center and Library. These computers are equipped with a variety of programming that provides needed accommodations/modifications for many different disabilities such as voice recognition software, text enlarging software, and Internet access with screen reading capabilities through programs including Magic, JAWS, and Dragon. A limited number of iPads with assistive apps are also available on a first come, first serve basis. Test modifications generally include use of the testing center and extended time. Typically, students who qualify receive time and one-half on quizzes and tests. These tests are given at a time dictated by the instructor and are administered by the Testing Center. The Testing Center provides a less distracting environment, extra time, computers with spell and grammar check and one with assistive technology. While the Testing Center can provide less distraction, it is not distraction free. Some students with disabilities may benefit from the use of a calculator in math and math related courses. Although CSCC does not provide computers for accommodations in the classroom, accommodations can be provided to allow for students to use their personal computers or tablets to personally take notes during class. Many students with disabilities need the services of a note taker. Disability Support Services will assist the student in locating a note taker in their class who will provide copies of their notes. If they qualify, students with disabilities can use a digital recorder, smart phone, tablet or computer to record lectures. Apps are available that allow students to take notes while simultaneously recording the lecture. Instructors will be notified of this accommodation in the student’s plan. Students must remember that information contained in recorded lectures are protected under federal copyright laws and may not be published without the consent of the lecturer. Students who are hard of hearing or Deaf will be provided an ASL interpreter or transcription in all classes and labs. Please notify Disability Support Services upon acceptance to the College as these services require time to schedule. Remember to turn in your Interpreter/Transcriber Requests as soon as you register for the next semester's classes. At least 6 weeks notice is necessary to ensure first day of class availability. Text to speech software or readers are provided for students with visual impairments or a reading disability for testing. Speech recognition software, screen magnification software or scribes are provided for students with visual impairments, motor difficulties, or written language disabilities.